Home»Blogs & News»Blog»What do Movable Bridges and Liftboats have in Common? What do Movable Bridges and Liftboats have in Common? For starters, they’re both large structures, and secondly, they both move a lot of weight. We have a serious reason for discussing this topic. Due to the similarities between the two heavy movable structure technologies, the opportunities for advancements may be shared between the two industries. First, what is a liftboat? For those unfamiliar with the offshore oil & gas industry, offshore jack-up vessels or liftboats are self-propelling buoyant vessels whose hull is integrated with three to four movable leg structures. These leg structures hold the weight of the vessel when it is lifted by the jacking system to stabilize the platform above the seas below. This allows the vessel to conduct work (such as subsea inspections, well decommissioning, deep sea drilling, etc.) as if it were on land, or some other non-moving structure. Liftboats have traditionally used rack and pinion drive jacking systems to lift and lower the vessel. 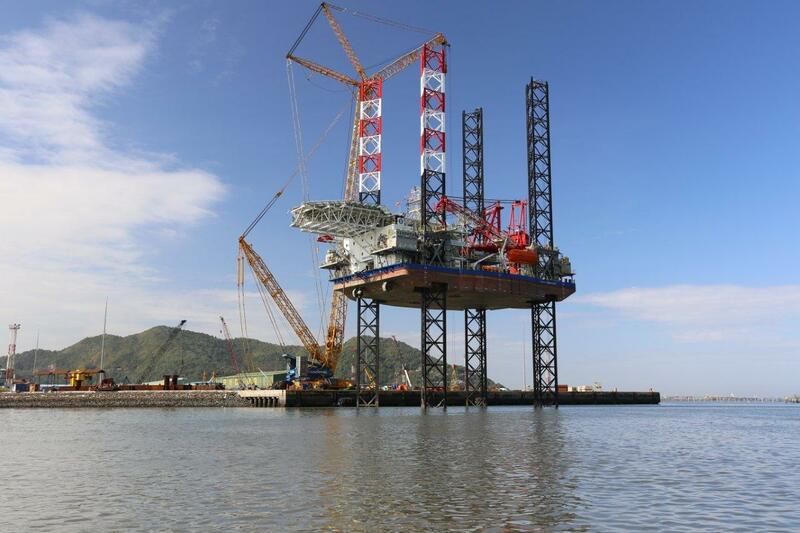 The leg structures on the vessel are fitted with a custom designed gear rack and a pre-defined rack profile which matches the jacking pinions installed in large gear boxes attached to the ship’s leg towers and driven by electrical or hydraulic power. The rack and pinion design limits failure during operation having a minimum of four gear boxes (two on each side of a typical pipe leg) while generating a substantial force to hold and lift the vessel. The size of the pinions and rack help ensure longevity of reliability since plastic deformation (work-hardening of the surfaces) strengthens the overall mechanical properties of the gear-to-rack interface. This same design can be translated to the vertical lift bridge industry using the motor driven, gearbox assembly, pinion attached to the bridge to translate rotary motion into linear motion via a fixed rack along pipes or within a truss structure on the shore. It could also translate into swing bridge designs, where a center pier motor driven pinion exerts a force against a sliding rack that would be in contact with a fixed bull gear attached to the bridge section. The rack and pinion design can add redundancy and the ability to move heavier loads by adding any number of gearbox assemblies desired, based on load case, speed, and reliability requirements. The system is much more versatile than the traditional hydraulic cylinder model. Wind farms are the newest user of liftboats, pushing limits to speeds of 4 meters per minute. These higher speeds are achieved through two speed hydraulic motors, that provide a high speed, low torque settingfor more rapid deployment of the legs and a low speed, high torque setting when the vessel is actually lifting. The two-speed arrangement can be applied to a bridge while opening and closing the bridge, to speed up the process in normal mode and protect the operation of the bridge in back up mode, i.e. loss of counterweight or loss of a gearbox assembly. During a swing evolution, the low speed could be used for creep speed when starting or stopping the swing, and the high speed could be used once the bridge is already in motion. Right now, many conventional electrical bridges incorporate constant speed electrically driven winches. A growing trend for both liftboats and bridges is incorporation of VFD motors, motor control centers (MCC) and control software. The VFD motors transmit the feedback required for the hydraulic control system, and the MCC controls the direction of movement and release of the brakes. The use of this new technology gives more control to the operator via joy stick operation and greater visual indication of system status, including electrical power available, electrical power demanded, electrical motor and brake status, lifting speed, position, and torque/load. For the liftboat industry, the use of VFD motors and MCCs can provide more information to either the operator on board the vessel or allow remote operation for owners/operators onshore. For the bridge industry, this may save the costs for onsite operators where remote operation of all bridge functions can be performed on multiple locations from a single site. As demonstrated above, many of the same engineering principles apply to lifting and lowering the heavy weight of a movable bridge as it does for a liftboat. Both the civil and marine communties continue to advance based on new expectations for lifting/cycling speeds, reliability and safety of operation, and intelligent integrated controls. While advancements for liftboats currently outpace the bridge industry, each can offer valuable insight and considerations for those designing heavy movable structures and the machinery used to put them in motion.